These are the beast Zindagi Hindi Shayari SMS Collection, These Heart touching zindagi shayari lines can be shared on whatsapp or facebook. वफ़ा सब से करो, वफ़ा की उम्मीद किसी से न करो. २०. कुछ पाने के लिए कुछ खोना नही बल्कि कुछ करना पडता है. वो किताबों में दर्ज था ही नहीं जो पढ़ाया सबक ज़माने ने. वक्त सबको जीना सिखा देता है. हम अपनी ‘ज़िंदगी’ मे हर किसी को ‘अहमियत’ देते है . जो अच्छे होंगे वो साथ देंगे..
और जो बुरे होंगे वो सबक देंगे..
We have applied our best efforts to collect these heart touching best life, Sad, Alone, inspirational, heart broken Zindagi Hindi Shayari SMS in hindi font. We hope you will like these collection. 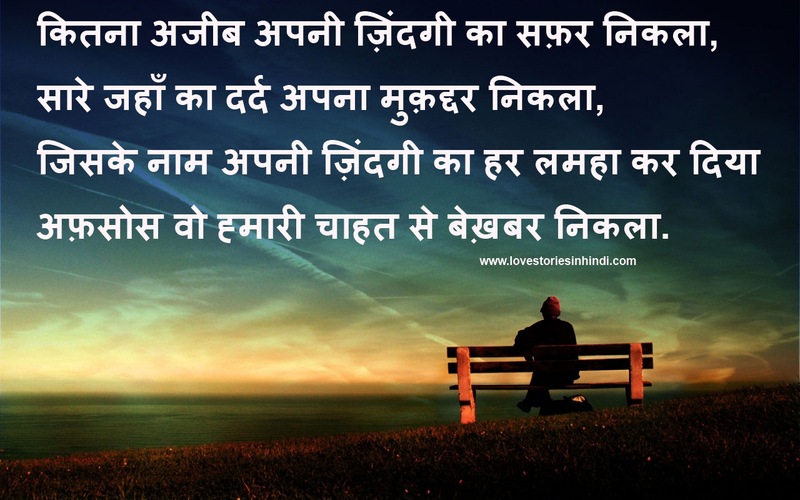 Please don't forget to share these Hindi Life, Zindagi Shayari SMS in pure hindi font with your friends.